The information contained in this web page pays homage to the relationship of the island as a territory of the Unites States, and glorifies the significant influence that the U.S. has had on the development of the island in all areas: cultural, technological, social, educational, economical, and to the overall quality of life. We will attempt to include information on different levels, from the very basic, ideal for young students, to more at depth articles and/or links for the more sophisticated and knowledgeable. This web page is not affiliated to any political party. In fact the relationship between Puerto Rico and the United States has grown under the influence of a number of different political parties during the last one hundred years. We shall include the point of view of all current political parties for your information and consideration so that you may reach your own conclusions. It is our purpose to provide you with the necessary information for you to consider and form your own opinions. It is not our purpose to make the opinion for you. Of course we are a web page in favor of improving American Citizenship and of United States relationships. When material or articles are sent for our consideration and publication, the closer these are to our goals, the more sympathetic we will be towards them. The further they are from our goals of strengthening relations between our people and the United States, the less sympathetic we will be. In any event, we will publish an adequate number of articles from all point of views so that you may form or reinforce your opinion. We do hereby give our authorization to copy, reproduce and distribute any material found in this web site. All content found herein are our opinions and those of contributing writers. We may or may not necessarily agree with the content of contributing writers. These are presented to you as different viewpoints. We welcome material for inclusion in this site, as well as suggestions for improvement. 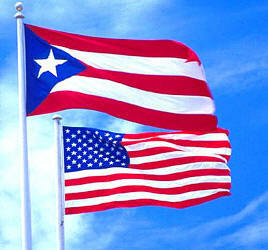 You may forward any material for consideration to prusa@puertoricousa.com. History of American Citizenship in P.R. Each section individually may contain additional information on its own subject. This information by various authors, will be listed at the bottom of each page. Just "click" the title to access its contents. You may also change to, or visit other sections of this web site by "clicking" on the title of the desired section which appear at the "directory" at the bottom of every page. The "Suggested Links and Bibliography" contains a considerable amount of related information by referring you to other areas in the internet. These are both your flags. Love them and defend them both! This web page is maintained by John A. Regis Jr.